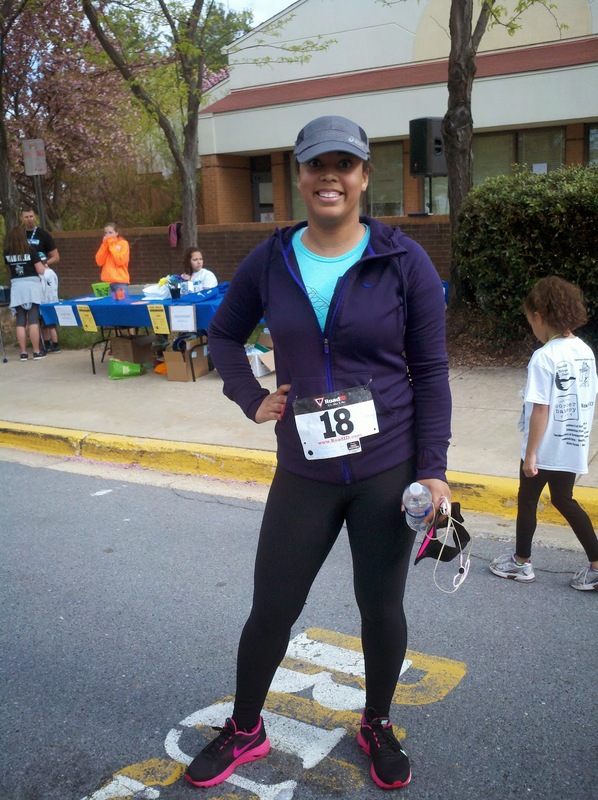 A few weeks ago, I ran my first 4-mile race, which is also the first race I've run in about two years. 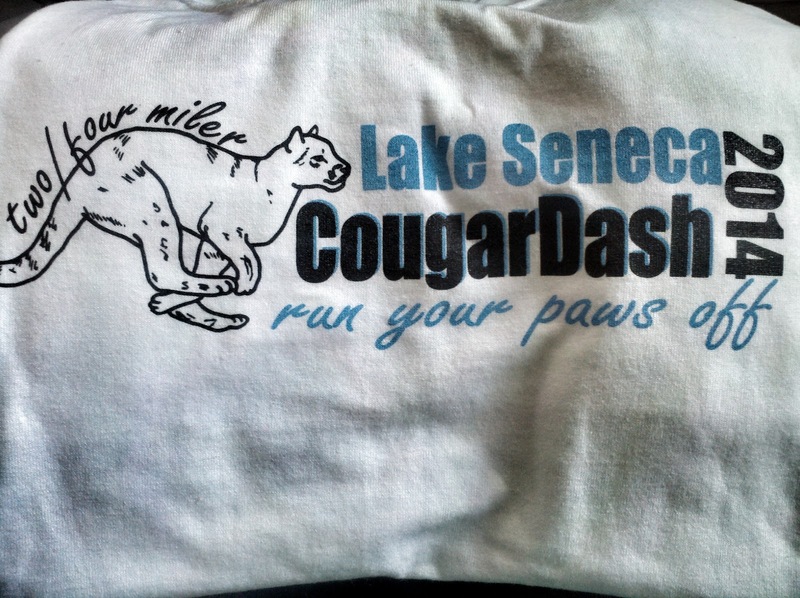 The race was called The Cougar Dash (not that kind of cougar), and I was invited to race by my teammate Nikki. Her daughter attends Seneca Lake Elementary School, and the school's PTA was hosting this race in order to promote health and wellness. The race was divided into two groups: the 4-mile race participants, and the two-mile race participants. The two-mile race could either be run or walked. Many of the elementary school students participated in this race, which was pretty cool to watch. I wish I had the opportunity to walk or run a race with my parents back in the 3rd grade! I didn't really know much about races until I hit middle school, and I volunteered at a few races in which my dad was running (or biking). The 4-mile race was the chip race, so it was officially timed, and you had to finish in an hour. (I shared some of my fears in this post.) During my training for this race, I feared that I was just running way too slowly to be able to complete the race in an hour. My roommate Sean told me that I was being crazy, and that I could probably walk four miles in an hour if I tried. That helped, though I was still afraid. I daydream quite often when I'm running, which means that I don't run as fast as I can or should. and couldn't stop smiling. I was so proud! Now, I'll be honest with you guys (like usual, of course). I read a lot of fitness and health blogs and articles. I've read countless articles on how to prepare for various of varying lengths, what to eat pre- and post-race, what to wear, what to expect, et cetera, but let me just come out and say it: I did not feel prepared for race day. Not even almost. Why are races so early in the morning?! This race was about 40 minutes from my home, and the race began at 8:15. I had to check in prior to the race, as well as figure out the parking situation, so I had to get there before 8 to make sure that everything was squared away and I could stretch and clear my head before the race. Why are "normal" races so early? Why can't they be more like the obstacle course races, and have beer afterwards? Okay, I get why they don't have beer after the race, but why so early? Goodness gracious! I can't even imagine how early people have to get up for larger races. I guess the reason they're so early is so that the neighboring roads don't get clogged up, the sun is not at it's highest point, and you have the rest of the day to yourself. I guess those are good enough reasons. I guess. I felt like I was able to accomplish a ton of things after the race, and before 5 p.m.!, so I guess waking up super early was worth it. I guess. I was really anxious before the race started. I hadn't had coffee, my hamstrings felt tight, I was really tired, and my music was going to be coming from an unreliable source -- a cruddy old phone I've been using since the Potomac River incident. I spent a minute or so attempting to tie my chip to my laces. I really did a lousy job, but it stayed put. (I wish someone had shown me this video on how to tie a timing chip before race day!) Eventually, I started fantasizing about the breakfast I was going to eat after the race, which of course led to more coffee fantasies. How the heck do runners clear their heads before the start of the race? I tried stretching a little during the group stretch that had convened at the starting line, and I tried shaking out the nerves. It worked a little, but there wasn't much time. Soon, the 4-mile race runners were directed to line up near the starting mats. How do those timing mats work, anyway? Ahhhh, I see. You know, I'm thinking that maybe I need to get one of those Google Glass things. I have a lot of questions. Then again, maybe that would only make me run even slower... I digress. I started the race, and it was really exhilarating. My music instantly failed, but the energy of the other runners was the perfect substitute for heavy bass. There was a group of middle-aged men who were running together, and they were pretty hilarious. They were cracking jokes and trash talking each other. They were also running pretty quickly. I tried my best to keep up with the bulk of the pack, but some of those runners were way, wayyyy out of my league. I should take a moment to explain how the course worked. Essentially, there were two laps of two miles apiece; therefore, the race started and ended at the same point. I was unfamiliar with the neighborhood, so the first lap was really me running with flashes of music (every now and then, I would pick up the chorus of a song on my playlist), trying not to be last, and trying to keep up with the group. I was really proud of myself after that first lap! I had no idea how I was doing until I heard one of the spectators yell, "keep it up! You're running a 10-minute mile!" That can't be right, I thought, until I saw the timer at the end of the lap, and sure enough, it said I was at 20 minutes as I hit the mark. Woohoo! My ultimate goal for the next year or so is to run a race at a 10-minute mile pace, so this was exciting news. Unfortunately, though, I knew that I could not maintain that pace. There weren't many runners near me (most were ahead of me), so I didn't have that energy to push me forward a little quicker. Additionally, it was starting to get warmer out, so my jacket was starting to make me too hot (that's what I get for wearing my ThermaFit. D'oh!). I did it! I ran the race in under and hour. Just a little bit past the halfway mark, I started having issues with this recurring problem I have when I go on long runs. I can't tell if it's from my allergies, breathing through my mouth when I get tired, or what, but I always feel like I need to spit once I run a couple of miles. I know this is probably too much information, but maybe some of you have a similar feeling when you run outdoors. Let me make this clear: I think spitting is absolutely disgusting; however, I feel like the feeling of needing to spit might be worse. Most of the time, I don't actually do it, but I'll admit that I have had no choice on more than one recent run. I know, eeeeewww! Go ahead and be grossed out. I know I'm not the only one who does it! Anyway, I completed the race, and well under one hour. Woohoo! My chip time was 45:03, which put me at 11:16/mile. The winner of the race zoomed to the finish with a chip time at 23:04 (a flippin' 5:46 pace). Essentially, he finished the race three minutes after I reached the halfway point. That is NUTS! How do some people run so fast?! Once I completed the race, I grabbed a water bottle, and spent the next 10 minutes stretching. It felt really good to stretch. Really, really good. What felt better than stretching? That free breakfast. KIDDING! What felt great was achieving a goal. It felt magnificent! So what's next? Well, I signed up to run the 5K Foam Fest in Maryland on July 12 (and yes, I'm definitely doing one of the later start times). I've been wanting to run one of those obstacle course races for a while, so now I get to do it! In fact, not only am I running this race, but I am also a Foam Fanatics Ambassador (a million thanks to Sweat Pink!). Are you interested in running one in your city? Use the 5k Foam Fest discount code FF3740 and get $5 off your registration fee! Would you like to run with me and my volleyball team? Join our facebook event and send me an email so that I can send you the password for our group. We're going to have a crazy getup for this race, so prepare yourself! Oh, before I forget: Have you entered to win a $50 gift card to SIX:02? What are you waiting for?! The chance to win is upon us! Click here for details on how to enter this giveaway. Awesome job!! I"m running a 4 mile race June 1. I don't know how some people run so fast...they inspire me though even if I'll never run that fast. Speaking of races starting early...the one I'm doing starts at 8 am, but you need to pick up your numbers by 7:30 am! And it's in Central Park NY, about 1 hour from my. Yikes...I do it all so I can complete 9 races and get automatic entry to next year's NYC Marathon! I definitely am not a morning person, so that sounds way too early for me lol Good luck to you! I hope you qualify!